How important is Social Media to today’s Business? With more consumers now online is social media crucial to your business, should you have it, manage it yourself or pay an agency? Millions of us use Facebook, Google+, Twitter, Snapchat, Pinterest and many more social media platforms every day. You can deliver direct to your customers a message, offer, competition or launch a new product line. The possibilities and opportunities for using social media are almost endless if done well. As a business, creating a Facebook page or Twitter account is common practice. From small general builders to huge retailers almost every business now understands the importance of using social media to get your brand online. The question is do you manage your company social media yourself or pay an agency to carry out this work for you? Posting on social media and answering customer questions, queries and complaints is really something your own staff aregoing to be better at. An agency may have looked over your website and got a ‘feel’ for your business. Do they have the understanding of your business goals and ethics, customers and products your own staff have? I think in most cases the answer would be no. If you are a SMB you also likely don’t have the resources to afford to bring in an external agency. To get the level of understanding of your business, your customers and your products and services an agency is likely to charge a considerable amount before they even start the campaign! So, how do you manage your social media? Firstly you need to decide which of the Social Media platforms you are going to use. Some research is needed to find out which social media platforms your customers spend their time on. Managing your social platforms internally or using an agency, if you are targeting a social media platform your customers don’t use you are wasting your time, money and efforts. OK, we’ll assume that you have looked over the last few months of the Google Analytics data for your website, trawled through the responses to your email marketing campaign and looked at your customers and their purchases in some detail. The results of your data mining may have identified that Facebook and Google+ are the main platforms your customers use. So, how do you get started? Following the social platform setup instructions on getting your online presence created should be relatively straightforward for someone with some online savvy. If you have no one with the knowledge within your business it may be worthwhile calling upon an agency to help you through the initial setup. With your social media account setup, a suitable profile picture and background image created you are ready to go. A tip for you background image design. Try to include your website, phone number and any other relevant contact details you can in the image. So, who is going to manage the day to day contact? If you have a sales department and customer services department you will likely need someone from each team to help manage the queries. If you do your marketing in-house you will want someone from the marketing team on board as well. The aim of your social media efforts should be the same as they are over the phone, through your website or via your brochure. Competitions and marketing posted by your marketing representative. Product questions answered by the sales staff and complaints and customer inquiries answered by the customer services team. Get the right people on the job and your social media will be a success. Get the wrong people and you could do your company more harm than good. When replying end with your first name, it’s more personal. “Many thanks, Irene – YourCompany Customer Services”. Interacting with your customers, being friendly and helpful through Social Media can have a huge positive impact on your business. Well thought out competitions and quizzes to get your customers interacting with you can increase your customer base, reinforce your brand visibility and all importantly INCREASE SALES! There is however a big problem with Social Media, if it is done well then you can sit back and reap the rewards, if it’s done badly then things can go real bad, real fast! 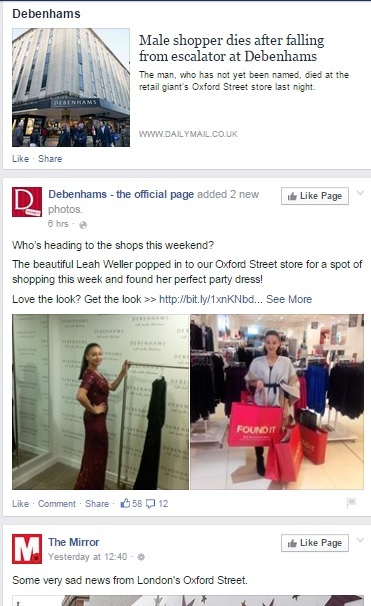 A recent tragedy at the Debenhams flagship store in London shows the huge power of Social Media. Estimates are that this social media mishap could cost them over £1 million. Debenhams are a multinational company operating since the eighteenth century. 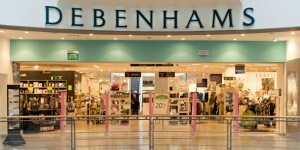 Debenhams have 172 locations throughout the UK and operate in Ireland and Denmark. An earlier incident at their Oxford Street store resulted in a customer falling to his death from a third floor escalator. Witnessed by shoppers and children in the store at the time it was a tragic and terrible accident. The agency responsible for their Facebook page clearly weren’t aware of the tragedy when posting. Unbelievably the agency posted that shoppers should visit their Oxford Street store. No mention of the tragedy or any offer of sympathy or condolences. The reaction to the Facebook post was less than favorable. The frenzied reaction is now spilling onto other social platforms. Customers are now posting their outrage at the inappropriate sales message at a time when a tragedy has occurred. Should a sales message be more important than the loss of a life? 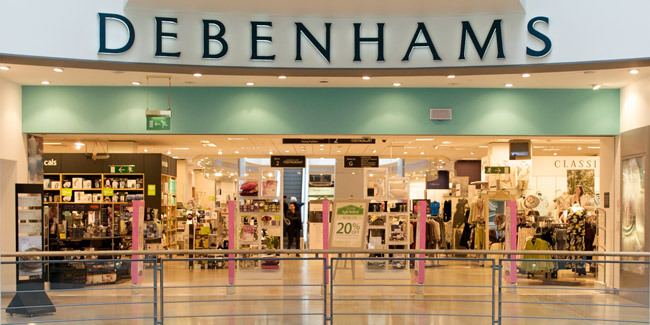 Early predictions from industry analysts estimate that the badly timed and less than sympathetic social media mistake could cost Debenhams over £1 million in lost revenue. 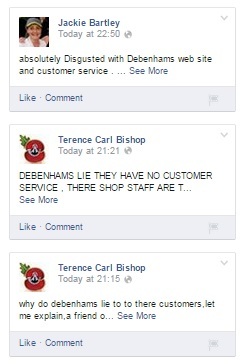 A very expensive lesson for Debenhams in the etiquette of dealing with your online presence on social media platforms.